Angelo's and Vinci's Ristorante offers banquet facilities with a festive, theatrical, highly decorative Italian atmosphere that makes any event a celebration...and there is always a reason to celebrate! Birthdays, anniversaries, holiday parties, graduations, award dinners, business meetings and more. Getting married? Congratulations! 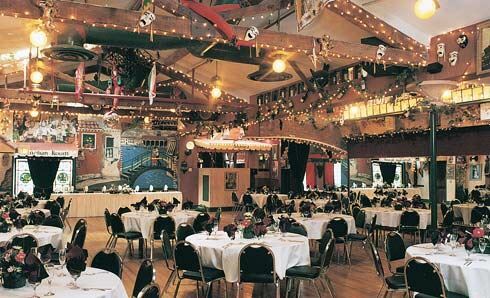 From a small, intimate rehearsal dinner or bridal shower to a wedding reception for 400 guests, Angelo's and Vinci's can fill just about any wedding need. With a professional staff of wedding coordinators, disc jockeys, bartenders and master of ceremonies, you will both be treated as guests at your own wedding reception. For big events, rent out our entire facility for up to 800 guests! "THE SIMPLE SICILIAN" Tossed Green Salad Rolls & Butter Rigatoni Marinara Coffee & Water Station (avail. Mon.-Fri. only) "PALERMO DUO" Tossed Green Salad Rolls & Butter Mostaccioli Alfredo Rigatoni Marinara Coffee & Water Station "THE PAVAROTTI" (worth singing about!) Tossed Green Salad Rolls & Butter Pasta w/ Choice of Sauce (Marinara, Meat, Alfredo, or Basil Cream) Choice of Chicken (Cacciatore, Marsala, or Basil Cream Sauce) Lasagna Coffee & Water Station Pizza Parties (for less than 100 people) Antipasto Salad Garlic Bread Pizza (1 topping per pizza) Coffee & Water Station Add a Pasta to your Pizza Party! (prices vary) Build an "ITALIAN FEAST"! Choice of Salad (Italian, Antipasto, Traditional Caesar) Choice of Specialty Bread (Garlic Bread, or Gorgonzola Garlic Bread) Homemade Tortellini with Choice of Sauce (Basil Cream, Marinara, Meatsauce or Alfredo) Choice of Chicken (Cacciatore, Marsala, or Basil Cream) PLUS: Lasagna Sausage & Peppers Fresh Steamed Vegetables Coffee & Water Station "THE WHOLE CANNOLI" Available to add to the "Italian Feast"! (minimum 50 guests, required) Champagne or Sparkling Cider Toast Two Bottles of House Wine (Chardonnay, Merlot or Cabernet) Soda Package Wedding Cake or Dessert Table Coffee Bar with Specialty Creamers & Sweet Accompaniments Full Linen Table Numbers with Stands Candle Centerpieces Silver Cake Plateau Please contact us for complete information on our Event Menus. Our Wedding Ceremony Package includes: • 30 minutes for your guests to arrive • 30 minutes for your Ceremony • Rehearsal for Ceremony (one hour and subject to availability) • Disc Jockey for Ceremony (when DJ is booked for reception) • Wedding Coordinator • Wedding Arch • White Runner • Two Candelabrums with Candles • Two White Pillars • Unity Candle Stand (hold three 12" taper candles, candles not provided) • Changing Room for Bride (one hour and subject to availability) Please contact us for complete information on our Wedding Ceremony Package. Some rooms can be combined to create a bigger event space. Please contact us for more information. Prepare to be transported to a magical place where the earth rises, flowers glow, stars twinkle, and paintings and murals burst into reality! Dine "al fresco" overlooking Fullerton and the lovely bell tower of the Plummer Auditorium. Surrounded by flickering candles, festive lights, beautiful stone statues, cherubs and greenery...you can't help but feel the romance!